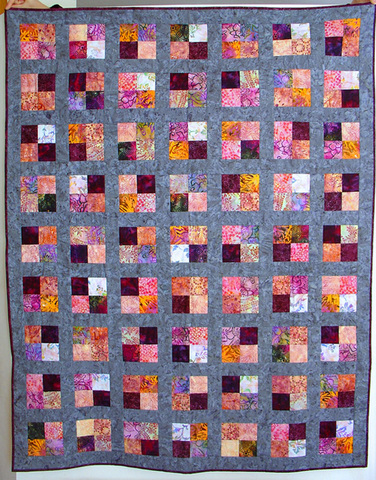 A simple quilt in purples for a woman who has helped take care of my great aunt. I knew that she liked purple, but didn't want the quilt to be a "purple quilt" so I chose a wide variety of batiks in lilacs and other purpley shades. I made four-patches and set them all in a rich gray-teal sashing. Quilting was done in the ditch to keep the design simple.